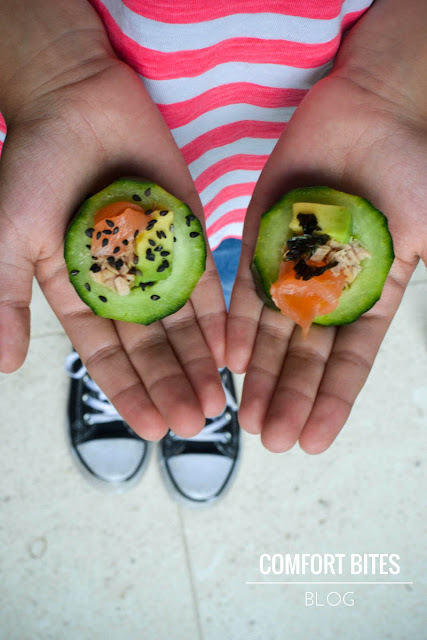 A simple, nutritious snack of tuna, avocado and salmon in a sliced cucumber centre. Paleo and AIP compliant, and perfect for kids. This post contains some affiliate links. This means that if you decide to click on a link and make a purchase, I might receive a small commission (at no extra cost to you) that helps me keep the blog going. Which got me thinking about paleo sushi - you know, a kind of sushi without the rice, that's still healthy? 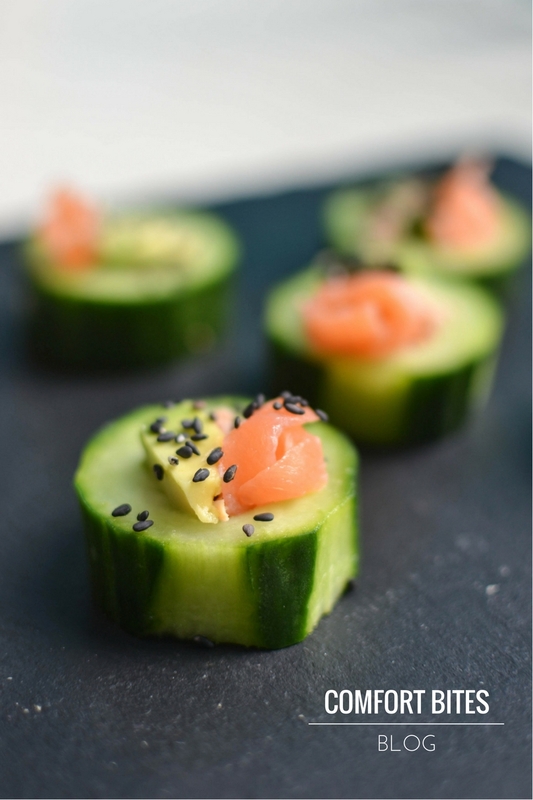 You just hollow out a slice or three of cucumber and fill it with tuna, smoked salmon and a chunk of avocado. Sprinkle with a few black sesame seeds (not AIP compliant) or crush over some nori seaweed and you're good. My kids love this. It's refreshing, crunchy, low carb and really tasty. Feel free to sub in your own favourite fillings if you like: chopped radish for a peppery crunch, wasabi or horseradish for heat or even stuff it with some chicken or beef. Slice your cucumber, if you haven't already, and, using a sharp knife, chisel out a little hollow in the centre. Run a vegetable peeler down the skin (you could do this before cutting, if it's easier) to make the stripes. Gently push a little of the smoked salmon and tuna into the centre of the hollowed out circle, and tuck in a small cube of the avocado. Sprinkle with the black sesame seeds or the crumbled up nori and you're ready to eat. Have you seen my ebook SPICE? It's chock full of over 90 AIP and paleo recipes that help guide you how to use spices and herbs in your every day cooking.